Reprint of LEC #373, 33rd Series, V. 11 in 1965. 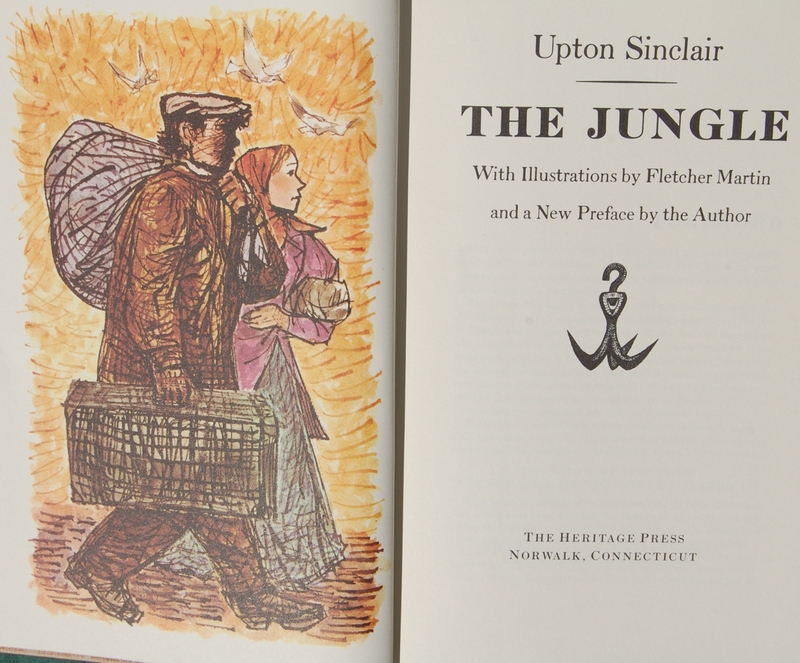 Front Binding – Today brings one of the more influential literary works of the 20th century: The Jungle, by Upton Sinclair. Sinclair’s scathing novel decried the poor conditions of the working class employed in Chicago’s meat-packing factories. Curiously, however, the disgusting revelations of how atrocious the meat production process actually was — the poisoned and diseased animals, as well as the unfortunate men that made the fatal mistake of becoming a part of the product they were paid to make — was not Sinclair’s actual intention of the novel. As the Sandglass notes, Sinclair was actually trying to make a case for socialism and a critique against the terrible wages of the workers. Sinclair wryly notes that he “‘aimed at the public’s heart and hit it in the stomach'” — but the overhauling of the meat industry was a positive in the end, and Sinclair continued his pleas in his other novels, essays and writings. Sinclair only had one LEC issued, but he does have the notable distinction of being one of the only authors to sign a LEC, joining the ranks of James Joyce, Robert Frost, Edgar Lee Masters, Van Wyck Brooks, and Wendell Willkie during the Macy’s tenure. Cardevon Press and Sidney Shiff had their fair share of author-signed volumes, including Ray Bradbury (twice! ), Thornton Wilder, Isaac Bashevis Singer (twice! ), Malcolm Cowley, Seamus Heaney, Derek Walcott, John Hersey (who also signed The Kingdom of this World), Robert Penn Warren (who also signed Hersey’s Hiroshima), Czeslaw Milosz, Arthur Miller, Gunter Grass, Octavio Paz, Friedrich Durrenmatt, Samuel Beckett, Joseph Mitchell, Margaret Walker, Heinrich Harrer (twice! ), Maya Angelou (twice! ; she also signed Sunrise is Coming After While), Leopold Sedar Senghor, and John Ashbery. Shiff in particular was aggressive in publishing more modern works and recruiting their authors to sign his editions; most of this list is from his time as head of the LEC. Whew! With that tangent over, let’s talk about this book’s illustrator, Fletcher Martin. Martin hasn’t been a stranger to the blog, with Tales from the Gold Rush appearing a few years ago. His career with Macy is detailed in that post. Martin is a good fit for The Jungle, if I may say so. 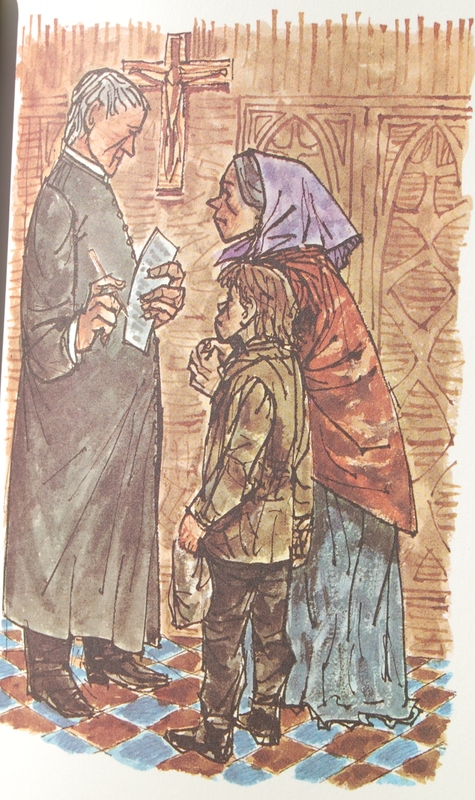 His style seems to enhance the plights of the poor and downtrodden, of which Sinclair’s characters must certainly are. Here he uses both line drawings (33 in all) and several colored pen drawings. Design-wise, John B. Goetz served as the designer of this book. I presume the LEC has the same designer. 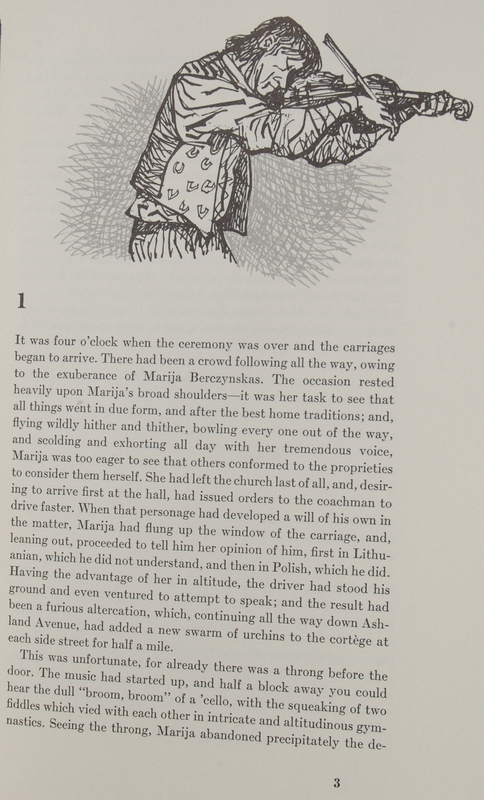 The main font is Monotype Scotch, with headings and page numbers set in Masterman. Printing was tackled by the Holyoke Lithographing Company on a paper supplied by the Warren Mill of Westbrook, Maine. 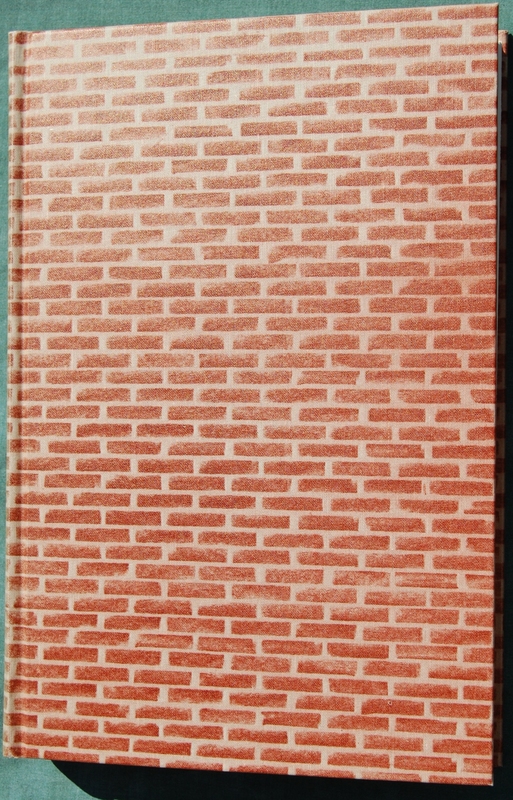 The binding is quickly glossed over, with the Sandglass quipping only about its “assured longevity” and “effective simplicity”. 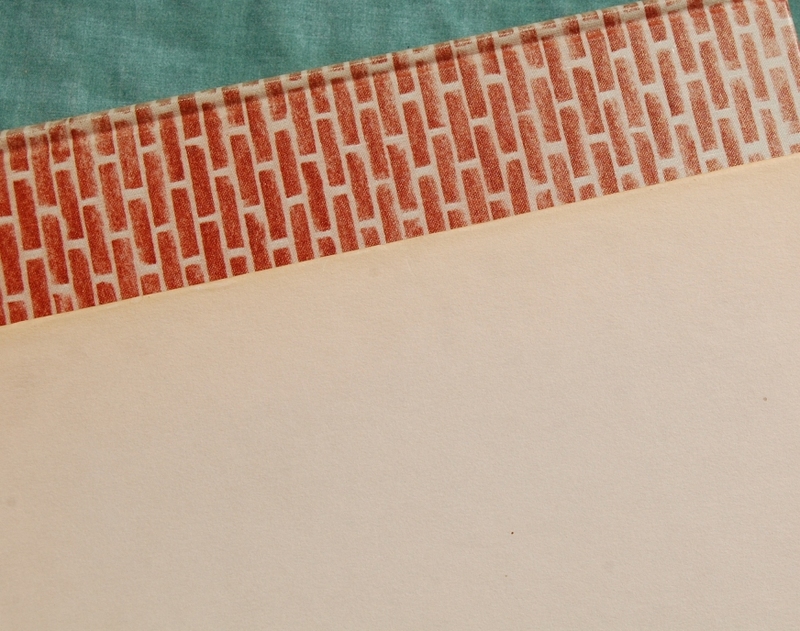 The original Heritage reprint had a nice leather binding in contrast to this Connecticut reissue. Spine – Mine is rather faded. Title Page – Sinclair himself steps in to introduce his novel; this is uncommon. The Sandglass argues who better to discuss The Jungle than its creator? Page 70 – And here’s an example of the colored pens. Martin’s work fits well, in my opinion. Personal Notes – I got this from my big haul from the Oakhurst Library. I’d like to have the LEC, naturally, but I’d be happy to upgrade this one to at least the Macy-issued Heritage over this. But for now, I’m keeping it until I replace it! You are currently viewing the archives for August, 2015 at The George Macy Imagery.